It is particularly noteworthy to recognize what exactly the Kingdom of heaven is being compared with in these three parables. Jesus says it's comparable with "treasure hidden in a field, which a man found," a "merchant in search of fine pearls" who found one "of great value," and a "net that was thrown into the sea." At first glance, what these parables have in common might not be obvious. Upon closer examination, each of these parables does have a common theme though. The theme consists of a "man" (Greek: anthropos1) gathering "all" possessions together (vv. 44, 45, 47) and sorting all the good (Greek: kalos, "beautiful" or "attractive") from all the bad (Greek: sapros, "rotten" or "corrupt"). This is why the explanation of angels going out and separating evil men out from the midst of righteous men "at the end of the age" is comparable with fishing in a sea. In the Bible, both fish and sea are oftentimes associated with mankind (anthropos) and the world outside of the promised land. To understand these parables, it's important to remember that the "end of the age" was the end of the old covenant age, which ended in 70 A.D. with the destruction of Jerusalem's Temple, its priesthood, and sacrificial cultus. When Jesus likened the kingdom of heaven to all these things, he was setting his audience up to recognize who the "good" and who the "bad" were. Whenever the net of his kingdom gets cast into the sea of mankind, a whole host of people are gathered together for sorting; except in these parables Jesus is referring primarily to the people of Israel in the midst of an ungodly kingdom within a Gentile (Roman) empire. The "good" are not Jews, but rather are the newly constituted Israel of God united to Jesus the Messiah. The "good" are those Jews and Gentiles who sell "all" to have Jesus. The "bad" (sapros) are the disciples of the Pharisees and other enemies of Jesus described this way earlier in Matthew's gospel (7:17-18). Let's not forget that the kingdom is also likened unto a net. When the people of the kingdom were cast into the sea of mankind, sent out with the great commission of Jesus Christ (Matt. 28:18-20), God used them to gather together all men--beautiful and corrupt together--for Him to harvest. 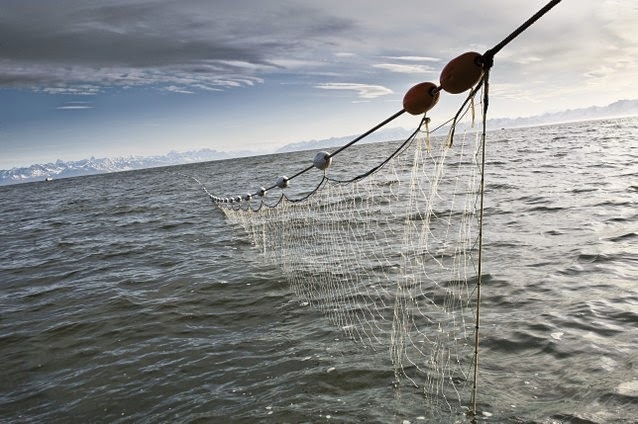 Whether it's more helpful to think of this as all sorts of fish harvested together from the sea or wheat and tares harvested together from the field, Jesus says that "angels" do the separating and sorting at harvest time, but it's the responsibility of God's saints to go throughout both land and sea to do the gathering. "Have you understood all these things?," Jesus asked his apostles. They responded as though they did understand everything. "Therefore," Jesus said, "every scribe who has been discipled (Greek: matheteuo) for the kingdom of heaven is like a master-of-a-house, who throws out of his treasury new things and old things." According to Jesus, every scribe of Israel who becomes his disciple is like a master-of-a-house. God has given him a house to care for and it's his own responsibility (as the master-of-the-house) to determine what "all" stays in his treasure-storage and what "all" goes from it. God entrusted Israel with an inheritance in His land, but Jesus came and spoke of soon-coming judgment upon the land of Israel and their consequent removal from it. At that time God would sort through and separate all the bad from the good from His own House, all the corrupt out of the midst of the beautiful of His own temple. If Jesus's disciples really understood all that he was saying, they would have understood that their mission as disciples of Jesus was to "clean house." Their great commission was to go and disciple (Greek: matheteuo) all nations so that a new treasury could be stored up in Christ and a new Israel gathered from both land and sea. 1. Verse 44 explicitly describes a "man" (ἄνθρωπος), and it's translated that way in all english versions. However, in the remaining verses it's a little more ambiguous. For example, the "merchant" of verse 45 is literally a "merchant-man" in Greek (ἀνθρώπῳ ἐμπόρῳ). In verse 52, when Jesus compares the disciple with a "master of a house," that word is literally "house-despot-man" (ἀνθρώπῳ οἰκοδεσπότῃ). In a similar manner, with the parable of the net, evil men are being separated out of the midst of righteous men (τοὺς πονηροὺς ἐκ μέσου τῶν δικαίων).